One question I was asked in Jakarta was how participants could convince their Chief Executives of the need for qualitative evaluation when these Executives most likely come from a quantitative perspective / function (ie Finance) themselves. I provided some suggestions for doing this during the presentation. However, I wonder whether these ideas really provide the right answer to this question. I think instead, that I would go back to the inputs I made on the S-shaped or sigmoid curve described by Charles Handy. This curve describes the typical lifecycle of products, companies, economies, jobs and people. The curve shows how progress starts slowly, picks up over time and increases more rapidly as positive feedback loops take effect. Eventually, however, the curve plateaus out and a new state of temporary equilibrium emerges as negative feedback takes control. Finally, this leads to decline and death. However, for products and for jobs at least, there will often be a second curve. Handy explains that the increasing pace of change means that these new curves are proliferating and that their life cycles are being completed ever more quickly. This is leading to increasing dissonance and confusion. Handy believes the paradox of change is that the movement from one curve to the next needs to take place when there is the least apparent need for it. If people wait until they need to change, resources and energy will have already been depleted. At this point, they have momentum for change but little capability to achieve it. In Jakarta, I provided one example from a session I had attended at Henley Management College earlier this year. Here, Mark Thompson, Director General at the BBC had used S curves to illustrate the changing nature of broadcasting. The BBC are competing against other organisations in three different S curves: analogue, digital and web. Each of these require different strategies and investments, which is behind the organisation’s current budget challenges. So for example, in the digital curve, the BBC needs to at least maintain its current number of channels, even though in the on-demand future of the web S curve, for which the BBC is developing its i-player, channels are largely irrelevant. Andy Grove’s Strategic Inflection Points (Only the Paranoid Survive), and Malcolm Gladwell’s Tipping Points refer to the same thing. I’ve also recently referred to Gary Hamel’s use of S curves to support his views about the future of management. My guess is that the next S curve isn’t so rooted in financial and quantitative disciplines as the current one. 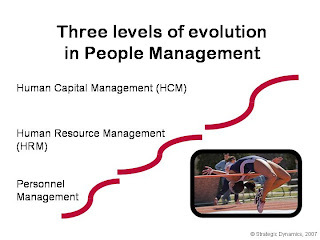 So do we make our case for the future of people management using the type of language that’s in use today, or do we focus on educating the rest of the business in this new, qualitative, people focused language, to help them move onto the next curve? I think to get real, transformation change, we need to bite the bullet and go for the later of these.